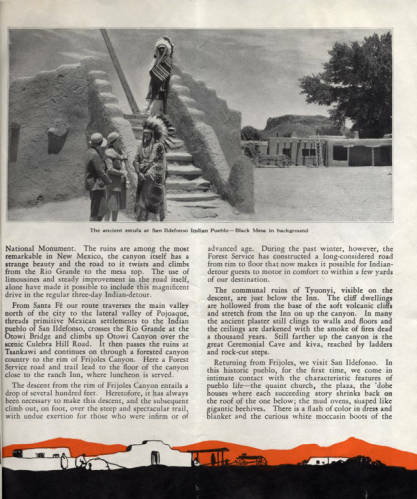 Indian Detours, another product of Fred Harvey, came about after the formation of Harvey's Indian Department. This department was tasked with teaming up with natives and a team of artists, ethnographers, and photographers that were to depict the "Indian lifestyle". The products of this division, while highly successful, further exoticized and fetishized the native people of the canyon. 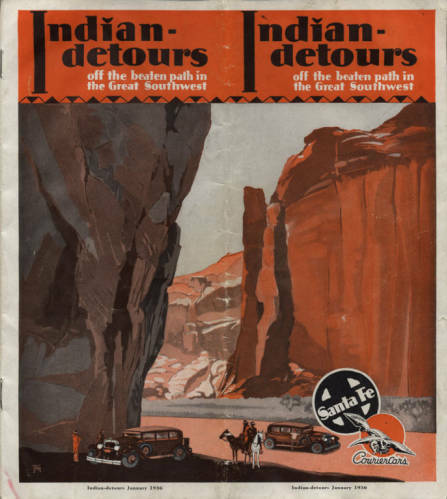 Indian Detours officially began in 1926. Rail travel was decreasing and the Harvey company saw this as an opportunity to capitalize on automobile travel. Teams of cars were composed and drivers were hired. Young and intelligent women were hired as tour guides and were expected to undergo several months of training to completely understand the area they would be taking patrons. The trips were meant as a 1-3 day detour from train rides offered by the Santa Fe in the southwest. The cars were eventually dubbed Harvey Cars and their drivers, Detourists or Dudes. The tour guides, or Harvey Couriers, took on a Navajo-style uniform - wearing things like concho belts or squash-blossom flowers. The cars would take travelers to Native American ruins and pueblos. The interaction between the natives and the guests was limited, meant to be taken in like an exhibit with accompanying brochure text and audible instruction. 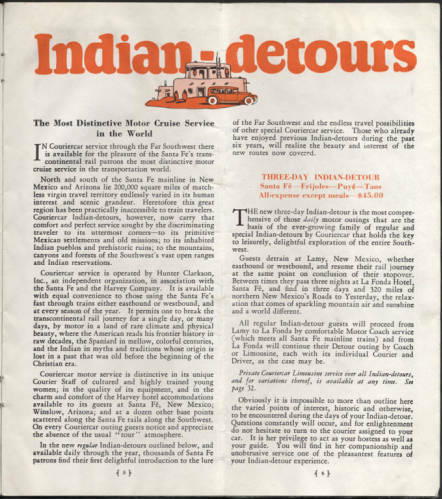 By the end of the 30s, Indian Detours was coming to an end. The Depression had taken away the market for in-depth, luxury tourism. Despite commodifying native culture, these tours did also educate and raise awareness of these people. Again, crafts and wares were sold as souvenirs. Though not much, this did provide a profit for the native peoples living there. Though only open for a short while, the effects of Indian Detours and Harvey's Indian Department are longwithstanding. Fred Harvey Southwest Indian Detours [constructed title].